The "Grand Canyon of Texas"
Texas is a state full of amazing natural attractions. However, one of the most amazing — as well as historically important — natural attractions in the Lone Star State is Palo Duro Canyon. Also known as the "Grand Canyon of Texas," Palo Duro Canyon is 120 miles long, 20 miles wide and 800 feet deep. Palo Duro Canyon stretches from the town of Canyon to the town of Silverton and today is part of the 20,000 acre Palo Duro Canyon State Park, one of the most unique state parks in Texas. Palo Duro Canyon was originally formed by a fork of the Red River. The oldest rock layer in the canyon dates back 250 million years. However, this rock layer, known as Cloud Chief Gypsum, can only be seen in a few locations throughout the canyon. The most prominent rock layer in the canyon is the Quartermaster Formation, which is comprised of red claystone, sandstone, and white gypsum. The Quartermaster Formation, along with the Tecovas Formation, form a feature known as the "Spanish Skirts." Although the region surrounding Palo Duro Canyon is one of Texas' least densely populated areas, the canyon itself was one of the earliest homes to people in Texas. Scientists believe human use of Palo Duro Canyon dates back some 12,000. The Clovis and Folsom peoples were among the first to reside in and utilize Palo Duro Canyon. Through time, the canyon was also important to a number of Indian tribes, including the Apache and Comanche. Although the "official discovery" of Palo Duro Canyon — the first time an American found it — is listed as 1852, Indians as well as Spanish explorers had known about and utilized the canyon for hundreds of years by that time. A quarter-century after the first American "discovered" Palo Duro Canyon, it was the site of some of the more infamous "Indian wars" and battles in US history. In 1874, the remaining Native American population was forced out of Palo Duro Canyon and relocated to Oklahoma. Once the Native Americans were purged from Palo Duro Canyon, the canyon fell into private ownership until it was deeded to the state of Texas in 1933. During a portion of its time as private property, Palo Duro Canyon was part of a huge ranch owned by the famous Charles Goodnight. However, once the property was transferred to the state, it became a state park, open for public use on July 4, 1934. 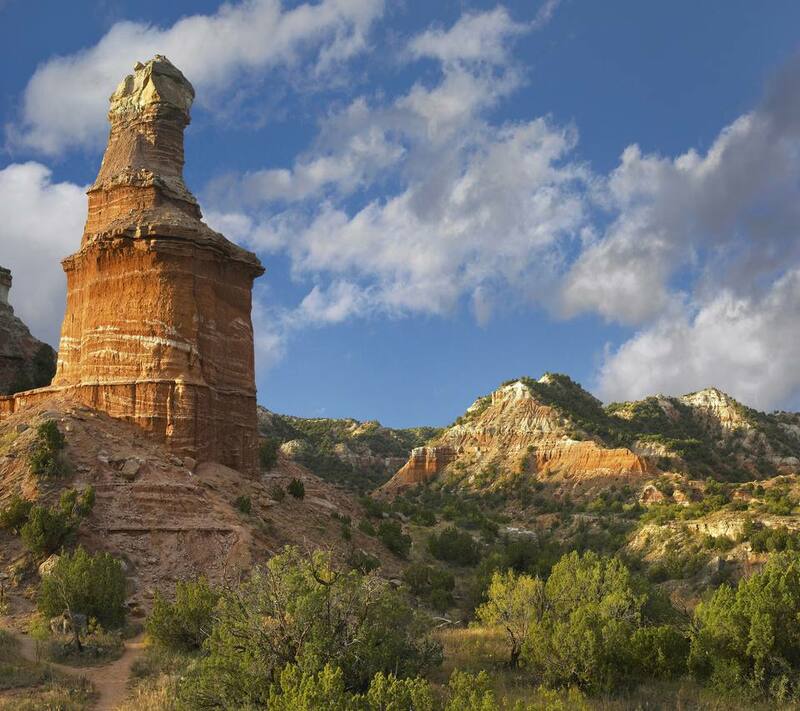 Today, Palo Duro Canyon State Park is a popular destination for outdoor enthusiasts. Sightseers hoping to glimpse the "Grand Canyon of Texas" are common. But, so are more adventurous outdoors enthusiasts. Hiking and camping are among the most popular activities in Palo Duro State Park. Mountain biking and horseback riding are also popular activities. In fact, Palo Duro State Park maintains and operates the "Old West Stables," which offer guided horseback tours and wagon rides. Bird watching and nature observation also pull in a number of visitors, who can expect to see some rare wildlife specimens, such as the Texas Horned Lizard, Palo Duro Mouse, Barbary sheep, roadrunners, and western diamondback rattlesnakes. Those wishing to stay overnight at Palo Duro Canyon State Park have a variety of options. The park features three two-room cabins, four "limited service cabins" (no indoor restrooms), campsites with water and electricity, water-only campsites, primitive hike-in campsites and backpack campsites.